ARCTIC VILLAGE, ALASKA – In this tiny Alaskan town of 120, north of Anchorage and the Arctic Circle, beyond the imaginary line where summer days and winter nights become endless, Sarah James, a Gwich’in Indian leader, is rolling in cash – $130,000 to be exact, a grant from the Ford Motor Co. It is, at first glance, an unlikely pairing: Ford products devour oil and gas; the Gwich’in (pronounced guh-WHICH-in) depend on caribou for everything from their meals to the gloves that keep their hands warm. Ostensibly, then, they are rivals when it comes to the future of the Arctic National Wildlife Refuge (ANWR), home to the Porcupine Caribou upon which the Gwich’in depend. Adjacent to Arctic Village, the refuge is coveted by petroleum companies and guarded zealously by activists like Ms. James. Last November, Ford awarded James a fellowship as one of the “Emerging Leaders in a Changing World,” a group of 20 outstanding but little-known national leaders. James, however, attributes the honor to her simple “common sense,” a gift she believes she has received from the land – and a grounding she’s used to defend the ANWR. With legendary modesty, James says she’s not sure how she was picked from an imposing list of 3,000 nominees, and insists that others are better educated. But she’s always had a vision of helping her people mobilize around a cause. Ambitious, perhaps, for a woman who heard little English until age 16, and grew up toiling with nomadic parents in their search for fish and caribou. Some of James’s earliest childhood memories are of wandering the cold, forested land with her parents in the 1940s as they traveled with dogs, lugging their winter supplies. In spring, they left their small cabin to travel the Yukon, Porcupine, and Salmon Rivers, sometimes using boats framed of birch and covered with hides of moose or caribou, heading upriver, where James’s father would hunt. Because of her family’s lifestyle, James did not attend school until she was about 10. Six years later, the Bureau of Indian Affairs sent her to an Indian boarding school in Oregon. “I had to study from time I got up till time I go to bed,” she recalls. She graduated from high school in 1967 at age 21, and took a job in San Francisco as a typist. After two years, she returned to Arctic Village – today a Gwich’in community consisting of a cluster of about 40 cabins, a school for 50 children, a water tank, a gigantic freezer for preserving meat, a community center, and a tiny, beautiful Episcopal log church. James quickly learned how to publicize Gwich’in concerns, typing hundreds of letters and helping form the Gwich’in Steering Committee, a grass-roots organization devoted to preserving caribou. Along the way, James began speaking out for other groups of natives. Before long, her simple, direct approach was attracting national recognition. In the 1990s, she traveled to Brazil, Ecuador, Nicaragua, and Guatemala, speaking for the underprivileged and the hardships they endure – and, as always, the caribou. Simultaneously, she began appearing on television programs, including a CNN telecast, the MacNeil-Lehrer News Hour, and the CBS Evening News. Late in the decade, she led several gatherings to the steps of the US Capitol, crusading for caribou and for preservation of the ANWR. She and the Gwich’in who accompanied her to Washington have tried to clear up concepts that they believe petroleum companies misrepresent. As James explains it, the Porcupine Caribou herd needs the arctic refuge for calving, a life cycle forged more than 100,000 years ago. According to the Gwich’in, the coastal plains of the Arctic National Wildlife Refuge are the core and sacred birthplace of the herd, the vadzaih googii vi dehk’it gwanlii – or “sacred place where life begins” – and this wild nursery must remain intact. Despite their regal appearance and the odd fact that both males and females grow antlers, caribou are best known for their annual migration, which, in the case of the Porcupine Caribou herd, often extends more than 1,000 miles – from the Arctic Ocean almost to Whitehorse, Yukon Territories. Migrating herds can travel in the tens of thousands, and when they move, the land itself seems to pulse. Biologically, caribou seek the north slope of the Brooks Range for a variety of reasons. They need an area far enough from mountains to be safe from bears and wolves, and they need a place where winds blow consistently to reduce insects. The Gwich’in also say that caribou need an area where vegetation is lush, and, according to James and most biologists, the caribou’s core calving grounds host one of the richest concentrations of vegetation on the North Slope. James says the untold story concerns geography. In the area where the Porcupine herd calves, the Brooks Range is separated from the Arctic Ocean by about 15 miles. Not so just to the west, where the Central Caribou herd calves. There, as you proceed from east to west, the Brooks Range sweeps to the south, so much so that the mountains are separated from the Arctic Ocean by almost 100 miles. James says that if oil giants drill into the core calving grounds (called the 1002 Area by the oil companies), the Porcupine herd must move to areas less ideal – areas where “there’s bears,” says James, “away from Arctic Ocean. 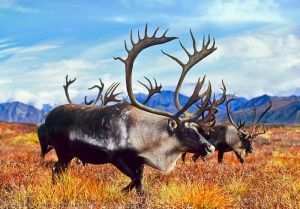 Although most petroleum companies claim they can drill in the refuge without consequence to the caribou, most Gwich’in – and many independent biologists – disagree. Biologists emphasize that although the Porcupine Caribou population is large, drilling would reduce the herd size. If that happens, caribou might choose new migration routes, completely bypassing this international group of villages established initially to intercept the herd. James insists the Gwich’in people need those caribou. Adjusting a pile of caribou antlers, she explains that each family in Arctic Village harvests about 15 caribou a year, as the animals migrate to and from their refuge. As in the days of old, the Gwich’in use every single part of the animal. The Gwich’in position on drilling in the Arctic National Wildlife Refuge has set them at odds with Inupiat Eskimos, who have the only community actually within the 19-million-acre refuge. The Inupiat believe that money they stand to receive from commercial oil drilling in a 1.5 million-acre portion of the ANWR will help lift them from subsistence living. Both sides have lobbied Congress vigorously. With a shrug of her shoulders, James says she’s not completely against opening a portion of the refuge to drilling. She says that in 20, maybe 30 years, science might create technology sophisticated enough to extract oil without harming the caribou. “But it’s not there now!” she exclaims. 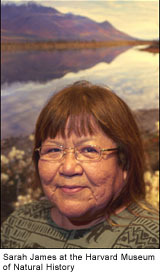 She also fears that if oil companies do drill in the arctic refuge, they’ll keep most of the profits for themselves, and they won’t hire locals – a habit that James says makes her people feel worthless, and may account for some of the tribe’s social problems, such as high rates of alcoholism and suicide. Standing in a graveyard, pointing to a flower-strewn site, James recalls how, in 1998, her 17-year-old niece took her own life. “Too many of our young people want to get to Fairbanks, where there’s drugs and alcohol. They’ve lost touch with the land, and that’s when we lose our pride. Over the years, some have heard her words clearly. Evon Peter, the 25-year-old chief of Arctic Village, says he’s benefited from her leadership. Faith Gemmill, current director of the Gwich’in Steering Committee, agrees, and adds that James helped groom her for the position. Because the sight of the tundra teeming with caribou remains an important vision for the Gwich’in, James also plans to use Ford funding to help with gas payments (about $4 per gallon) required to transport youngsters upriver to distant camps. There, she hopes, they’ll marvel at the caribou, gain pride in their roots – and perhaps gain a taste for grass-roots activism in defense of their way of life. Or maybe they’ll learn to resist the temptations of a more “civilized” lifestyle. Perhaps James has “mobilized” yet another young person, but she plans to do more. She’s definitely a woman with a well-defined mission in service to her people. And if common sense can be considered a discipline of deeds underscored with care and love, then James may be ready for her PhD.